I had earlier shared varied dosa recipes with yummy fillings, and today's turn is the Panner Dosa Recipe. Though I had planned to prepare panner masala dosa I wanted to taste it in a restaurant as a benchmark to compare with my preparation. We visited a popular vegetarian restaurant here and went on to order panner dosa, and I hate to spill it out, it does not taste good. The filling was just the panner with some sauteed onions and ghee. I was really disappointed about the texture aw well as the taste itself. Back home I decided to prepare the panner masala to suit my taste buds and it tasted just yum. I was really happy that the result was satisfying. You could check my other dosa with different fillings such as Mysore Masala Dosa, Masala Dosa, Beetroot Masala Dosa, Broccoli Masala Dosa, Pav Bhaji Dosa, Mushroom Masala Dosa, Chicken Masala Dosa, Nutella Banana Dosa and Palak Paneer Dosa. Heat oil in a pan and add the onion with a pinch of salt; cook till soft. Now add the ginger garlic paste and cook till raw smell leaves. Add the chopped tomato and cook till soft and mushy. Add the masala powders turmeric powder, red chilli powder and coriander powder; mix well and cook for thirty seconds to relieve the raw masala smell. Add some salt to taste. Now crumble the paneer and add in to the masala; mix well and cook for a minute till the paneer cooks so that the masala coats well. Sprinkle some coriander leaves and mix well and switch off the gas. To make panner masala dosa, Heat the dosa tawa and grease it with little oil. 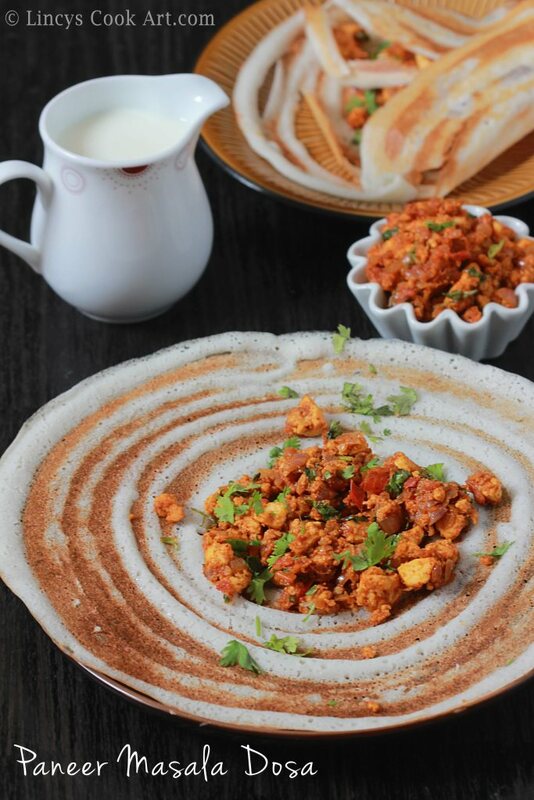 Add a ladle full of batter and spread the dosa to make concentric circles. Drizzle little oil on top and cook till it becomes crisp. Keep 2-3 tablespoons of filing at the centre of the dosa and fold the dosa as you desire. Note: You could add half a teaspoon of coriander powder if you wish with the masala.